Journalist Hanna Axelsdotter moves into a rental apartment in central Stockholm and finds her neighbor’s door blocked and covered with police tape. Then it’s revealed that the apartment belongs to Esther, a young woman who is living a complicated double life, and who was just reported missing by her boyfriend. In the same apartment house lives Adrian, a lonely survivalist preparing for the downfall of civilization. He has a firm belief that Esther is in big danger. Hanna is puzzled by the fact that no one seems to know anything about Esther’s life. But the police suggest that Esther might have decided to disappear of her own free will and therefore are devoting fewer resources to solve the case. Hanna’s instincts say that something isn’t right, and she determines to hunt down any traces of Esther. Would an old tattoo of a pair of tiger eyes be of any meaning? Or did everyone miss the fact that there might be a connection between Esther’s double life and her disappearance? 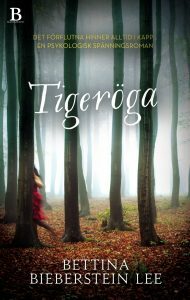 Tiger's Eye is the second, standalone, installment in the novels about journalist Hanna Axelsdotter.